MVUC’s annual operating budget exceeds $600,000 per year. 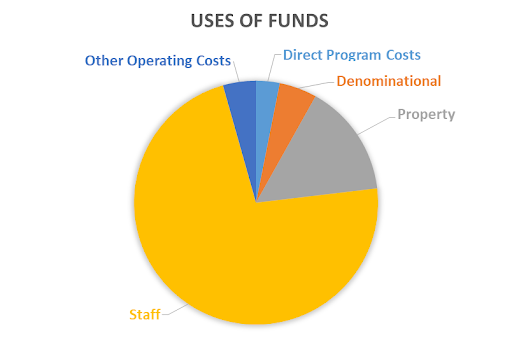 With about 200 member households, the cost of church operations comes to over $3,000 per household per year! Fortunately, other revenue sources defray part of that cost. But the fact remains that stewardship—committed financial support from members and friends—is our major funding source. 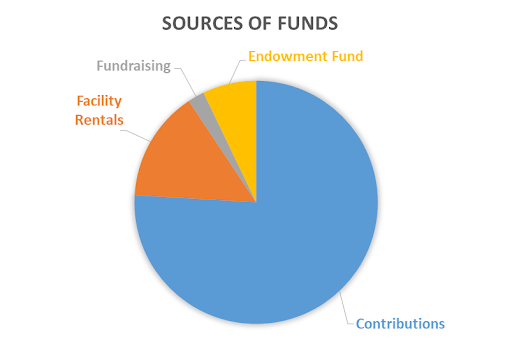 These pie charts show how our operating budget typically splits into various sources and uses of funds. For more information on finances or to obtain copies of recent financial statements, send a request to admin@mvuc.org.